There are only two countries in the world that have alligators. The alligators in China are an endangered species. American alligators are not -- they live from the Carolinas to Florida and along the Gulf Coast. My 6 year old helped a little bit and both of my girls really liked the end product, but I'd say the craft should be made by Age 8+. The only "store bought" material is green paint (tempra, poster or finger paint all work well... Acrylic paints work great, but don't wash out of clothes!!!) If you don't have green paint, green tissue paper or napkins will work too. 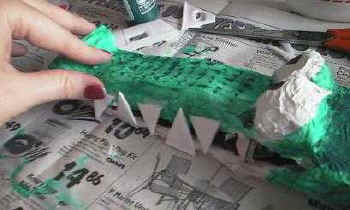 My alligator took about 2 oz (100 ml) of green paint. Optional: white paint and red paint (the craft works fine without these)! 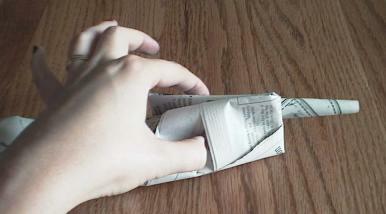 Take one piece of newspaper. Cut it in half along the crease. 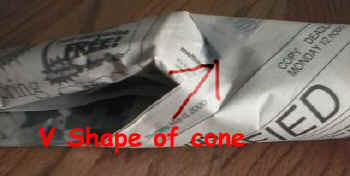 Take the other 1/2 and roll it into a long cone. Fold the sausage in half (this will be the alligator's jaws ), but make the top half a bit longer (about 4 to 6 inches longer) than the bottom half. Roll the longer piece to make the snout. Tape snout well! 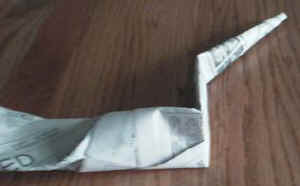 Fold the part just below the flattened back to the left and then fold in half again to the right (Z-shaped). Pinch/crease. Let go so you get a zig zag tail if it didn't zig zag enough, pinch/crease it harder! 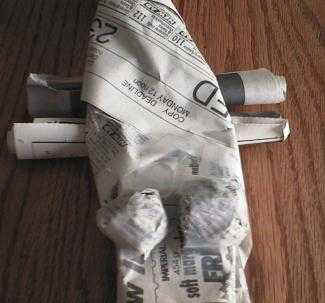 Now the eyes... Make two newspaper balls (about 1 inch balls) and tape them really well/tightly so they don't unscrunch. Then tape them to the top of the alligator's jaws. And last the legs (your alligator may be a bit wobbly up to this point... Don't worry!). Make two more newspaper sausages long enough to stick out at least an inch on either side of the alligator. Roll nice and tightly this time so he has sturdy legs. Tape well to the bottom of the alligator. I should have put them a bit farther apart than I did, I think. Take your white tissue paper (toilet paper, kleenex or paper towel will also work... We used toilet paper *grin*). The white paper (whichever kind you chose) will make him more solid and will make it easier to paint him (less paint required than if you were painting over newspaper). "You could paper mache it with green crepe paper and just fill in the details with paint, and maybe it would make it harder." Thanks Robert! Coat your alligator with mod podge, paper mache paste or white glue dilluted 1/2 and 1/2 with water (we choose the white glue/water solution and painted it on with paint brushes). Lay 2 layers of toilet paper/tissue paper ALL OVER your alligator. The tissue will soak onto the alligator in a minute or two. Use your paint brush and some more glue/water solution to get the toilet paper wetter when necessary and into all the crevices. Don't forget to do the inside of the mouth!. Use scissors to clip off exess as necessary. Let dry (likely overnight). At various stages, you'll be letting him dry (now and while painting). I always propped his jaws open with a lightly crumpled piece of newspaper whenever he was drying so his jaws didn't stick shut. 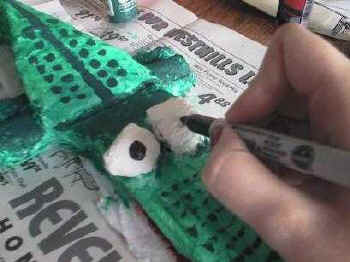 Take your green paint and paint your alligator (except his eyeballs). If you have red paint, leave the inside of his mouth unpainted. If you don't have red paint, paint the inside of his mouth green. 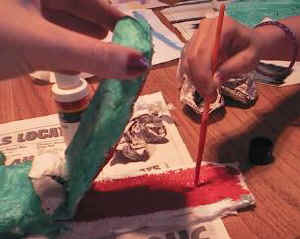 If you don't have paint at all, you could use green tissue paper or napkins and the same paste/process as in STEP 2. If you have white paint and/or red paint, paint the inside of the mouth red and the eyeballs white (the eyeballs are pretty white without the paint, so it isn't the end of the world to skip painting them)Tasha liked painting the mouth! Take some markers (or other colours of paint) and draw on some detail: black eyeballs on the eyes, nostrils on the snout and darker green splotches on the back and top of the jaw. I also drew a line down the center from his jaws to the tip of his tail. ...and glue them onto your aligator's jaws. "I did this alligator project with my 4 and 5 year old but we sort of changed it. We used a paper egg carton for the body and left the first two 'cups' out for eyes. We then followed your instructions for making the mouth and the tail. I inserted the edge of each into the ends of the egg carton and closed it up with tape and then covered the whole carton with paper mache to make it smooth, except for the "eyes" these we left alone. We then put his legs on him and covered him all over with paper mache and let him dry. We then painted him green and glued on those little eyes you can get at Wal-Mart, attached some wire on the back and hung him on the boys wall in their room...It looks like he is cruising down the wall! THEY LOVE IT! Best thing was, they made it. It has been to share time twice now (once for each one) Both of their teachers want to have the class make one now." "For the Alligator paper mache project...green tissue paper (versus crepe paper) would be a good option too. Purchase it at a dollar store so it isn't too cost prohibitive."